Sarasota Dentistry provides safe and effective tooth extraction for patients suffering with badly damaged, or decayed teeth. A patient might need to have a tooth extraction for a wide variety of reasons, not just damage and decay. Other problems include tooth crowding, infected teeth, vertical root fractures and periodontal disease. Always consult your dentist to determine if a tooth needs extracting. Dr. Michael has the expertise to determine the best plan for your dental treatment. We regularly perform effective and safe tooth extractions along with a “socket preservation procedure” as well as follow-up procedures for patients who would like to restore their smile and improve their health. Many patients wonder what they will need to do to guarantee their dental and overall health after a tooth extraction. The tooth extraction procedure is not completely without risk. You might experience tenderness, or prolonged bleeding. A slight chance of infection or a dry socket can happen if the extraction site isn’t properly cared for after the extraction. We always recommend performing a socket preservation procedure in conjunction with a dental extraction to minimize the risks of pain, infection and bone loss from the tooth extraction. Dental extractions are a safe procedure that eliminates the danger of a broken or decayed tooth becoming infected. A tooth extraction takes special care from an experienced dentist like Dr. Michael to ensure it is performed properly. Dr. Hank Michael has over 15 years of experience providing tooth extractions, bone grafting, smile restoration, and other valuable dental treatments for Sarasota and the surrounding communities. We serve patients across Florida — Siesta Key, Palmer Ranch, Lakewood Ranch, Bradenton, Palmetto, Venice, and the surrounding areas. Our team takes the time to carefully understand your needs, and places an emphasis on comfort and precision. After tooth removal, the space created must be filled with an appliance, or your other teeth will shift to fill the missing space — this can directly contribute to misaligned teeth or jaw problems. It is important to replace the missing tooth with the proper dental appliance. Dr. Hank will discuss appliance options with you, including dental implants, removable partial dentures, or a dental bridge. Choosing the best dental replacement for your missing tooth is part of the extraction process at Sarasota Dentistry. What is a Socket Preservation or Bone Grafting procedure? Traditionally, the removal of a tooth is followed by a blood clot that takes months for new bone to be formed. Research has found that this simple extraction process results in a greater amount of bone loss than if a bone graft is placed at the time of extraction. Modern dentistry has evolved a way of boosting the bodies healing process through a "socket preservation" procedure including a bone graft and a PRGF membrane. A small amount of blood is drawn from the patient and separated in a centrifuge to concentrate the Platelets Rich in Growth Factors (PRGF) prior to the dental extraction. Once the tooth is extracted the socket is cleaned and disinfected and then filled with a either a human or animal bone grafting material. The graft is then covered with the PRGF membrane and a collagen plug and stabilized with dental sutures. Some of the many advantages of the Socket Preservation procedure include: less pain, less bleeding, more bone preservation, decreased risk of dry socket, faster healing time, less annoying food trapping in the extraction socket. What is the post-extraction process like without a bone graft? First, you'll want to bite down on a piece of gauze for at least 30 minutes after your procedure. This will help to stop the bleeding where your tooth was extracted. You will be given additional gauze to repeat this 30 minute procedure once or twice. If bleeding persists, try a moist black tea bag. Tea contains tannic acid (.i.e. black tea or breakfast tea), which can help stop bleeding. Once your extraction site stops bleeding, you'll want to avoid any vigorous mouth rinsing for about 24 hours. Then you can begin to start rinsing gently with warm salt water. Dr. Michael may also instruct you to use a prescription strength mouth wash every twelve hours for 1-2 weeks. Eat only soft foods and drink plenty of liquids. If your bleeding hasn't stopped after 24-48 hours, give Dr. Hank Michael's office a call, otherwise you may develop a dry socket. A dry socket can easily be treated with a medicated dressing or PRGF, which will promote healing and clot formation. Dr. Michael always recommends PRGF and bone grafting immediately following a tooth extraction, post-op complications and bleeding are virtually eliminated with that combination as well as a significantly expedited healing time. What foods and activities should I avoid after tooth extraction? Once the process of tooth extraction is complete, the time it takes to heal depends on a couple of factors. The size of the extraction site and your future dental treatment schedule both affect the healing of your extraction site. In the first 24 hours: Bleeding should stop, discomfort should decrease, and you'll notice tenderness and an irregular feeling in the area around the empty socket. There may also be some swelling, but that should peak within the first 24 hours and then subside. During the first 1-2 weeks after tooth extraction: you will notice the socket hole has begun to heal fairly well, although wider and deeper extraction sites may still show an indentation at the extraction site. If you had stitches, they will usually fall out or be removed after the first 7 days. During these two weeks, your extraction site is still fragile -- crunchy foods or rough brushing may cause additional bleeding, so be careful. Most of your soft tissue should be healed 3-4 weeks after your tooth extraction and as little as 1 week when PRGF and bone grafting were performed. At this point, most of the remaining healing will take place in the jaw bone. It may take 6-8 months for your jaw bone to substantially fill in the empty tooth socket - 3-4 months when bone grafting was performed. The extracted tooth sockets will fill in and smooth over during this time. The bone in this region may appear sunken, but the final appearance of the extraction site is largely dictated by the size of the original wound. Depending on the type of extraction, the cost can vary. Common estimates for a "simple" tooth extraction -- one without complications -- can vary from $300 - $400. These fall under the category of routine tooth extractions and are not complicated. However, a "surgical" tooth extraction can vary from $500-$800 depending on the complexity of the extraction being performed. 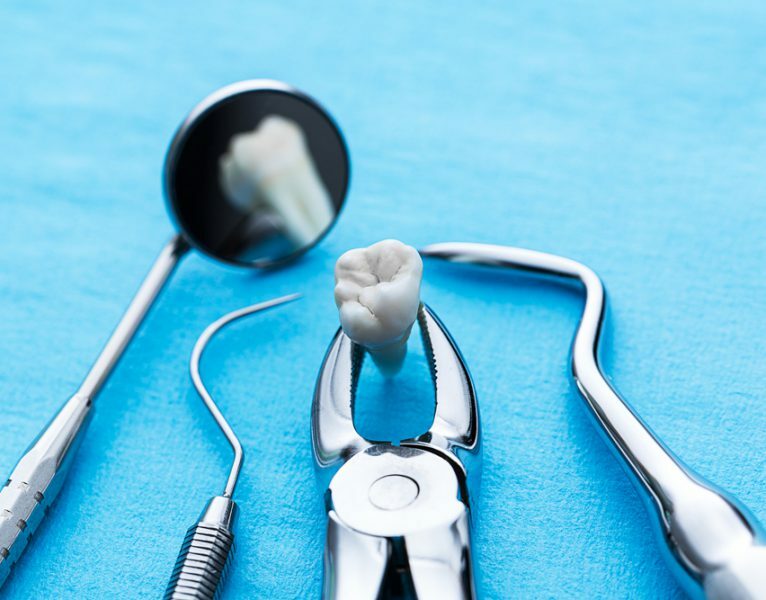 Surgical tooth extractions require additional steps like trimming and sectioning the bone to facilitate the removal of impacted dental roots.. In any case, no tooth extraction should cost much more than these estimates unless multiple teeth are being extracted or PRGF and bone grafting is being performed in conjunction with the dental extractions. Does dental insurance cover tooth extractions? Most dental plans provide some kind of coverage for routine tooth extractions. The coverage usually categorizes the extraction procedure as a "basic dental service," meaning 70-80% of the procedure's cost will be covered by insurance. Depending on the type of extraction being performed and the complexity of the procedure, the cost of tooth extraction and the amount covered by insurance may vary. Some insurance policies dictate that the tooth extraction must be medically necessary -- this encompasses all of the common reasons why a bad tooth should be pulled. If you have more questions about how your dental insurance covers tooth extraction procedures, contact us today.